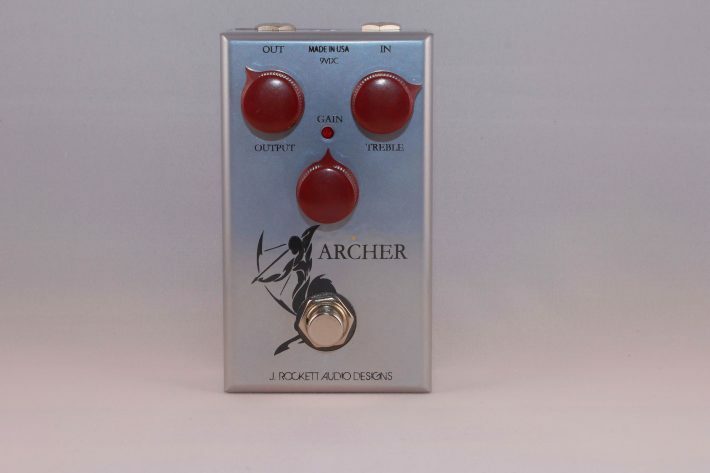 The J. Rockett Audio Designs Archer is by many accounts one of the closest-to-the-real-thing Klon clones. Of course it helps that J. Rockett worked on the KTR, and apparently picked up a thing or two in the process. Regardless, a new Archer can be had for a fraction of the price of an original Klon, and for around the same price as many of the other klones, making it a nice option for those who find its nuances to their liking. 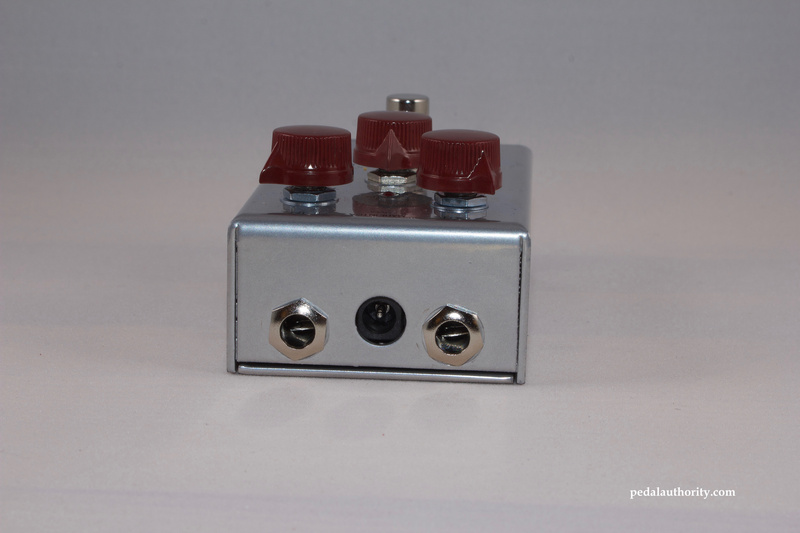 To our ears the Archer has a slightly tighter low end than the original silver Klon. This is especially true at higher gain settings, where the Klon tends to get a little “woofy” or “saggy” in the low end, while the Archer stays tight. The Archer also seems to have a teensy bit more of a hump in the mid range compared to the Klon, though we all know that the Klons do vary unit to unit. Compared to a more stable reference point, the Archer has a slightly more pronounced mid hump than a Wampler Tumnus (original version). On the whole this makes for a unit that does quite well as a clean boost. Apropos of that point, one of the main differences between the Archer and the Ikon (the latter being J. Rockett’s gold klone) is that the Archer is cleaner and in general seems to have more headroom. This is nice if you tend to favor a klone for its clean boost capabilities. Of course the Archer does have plenty of gain on tap, but through the first half rotation of the gain knob the pedal stays relatively clean. Output: controls the pedal’s overall output signal. As is the case with many klones, it can be beneficial to find a good ratio between the output and gain settings. The output knob is not simply a master volume control for the pedal, and some tweaking can yield some very useful and desirable results. This pedal has lots of headroom, and you may notice that the output knob on the Archer is much more sensitive than what you might be used to. Gain: adjusts the level of gain, or overdrive. Turn it up for more gain, turn it down for less gain. If this is your first foray into the world of klone pedals, you should know that the drive control functions a little bit differently than that of a more typical overdrive pedal. Like many klones, the Archer is constructed in such a way that turning up the drive control dos not simply increase the gain. Instead, the circuit starts with your clean signal (or whatever the quality of the signal is that enters the pedal) and then actually blends the overdriven signal into the mix as you turn up the drive knob. 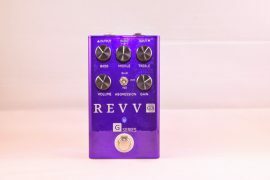 The general idea here is that the pedal emulates the character of a tube amp as it is turned up through each of its characteristic stages, from clean to breakup to overdrive. Treble: is essentially a treble control (single band EQ), and controls the pedal’s overall EQ profile. Turning this knob up will increase the treble, while turning it down will roll off the treble and give you a warmer sound. This knob has a generous range that delivers some delightful chimey tones (more chimey even than any of the other 3-knob klones we have reviewed up until this point) at higher settings, as well as some creamy and smooth lead tones when turned down below the noon position. If you are using this pedal as a clean boost, the tone knob can help you match your amp’s tone, so that when you do kick on the boost it does not affect the EQ profile of your sound. 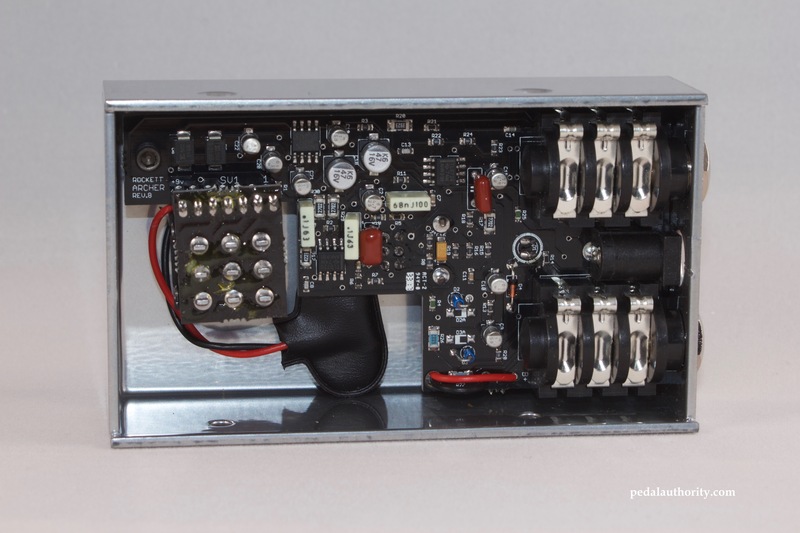 This allows you to maintain the character of your amp’s inherent sound, while providing extra sustain and EQ options. As always, we tested the Archer with a couple of different amps and found that it lent some nice mojo in a variety of contexts. Running into our trusty Fender Blues Jr., the Archer did help eliminate some of that classic small amp boxiness. As a clean boost, the Archer did extremely well and its chimeyness allowed us to make the Blues Jr. sound almost like a Princeton. Turning up the gain gave us a thick and creamy tone, well suited to lead playing, yet clear enough for rhythm playing as well. The Archer’s massive amount of headroom meant that it played very nicely with a loaded and cranked Peavey 6505+ head. Lots of clarity, a slight midrange bump, and way more input signal than you would get without the boost. Actually, when compared to our Fortin 33 boost pedal, we found that the Archer did a good job of mimicing the focus and intensity of the Fortin. 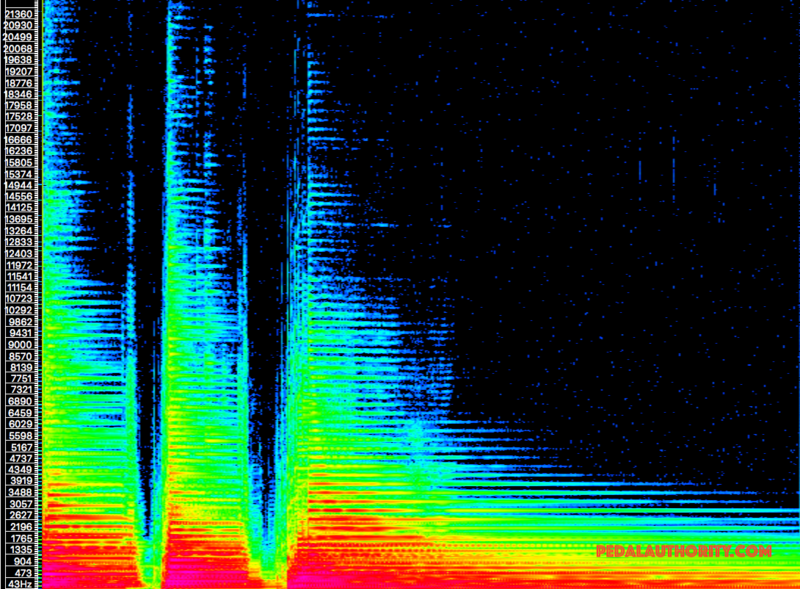 Not what one would immediately expect from a klone, but a nice side effect of the Archer’s sparkly clean signal. One thing that must be mentioned is that the Archer (like several other klones) does produce a heterodyning effect when paired with certain other pedals. Strymon pedals in particular have been known to bring out this side of the Archer. 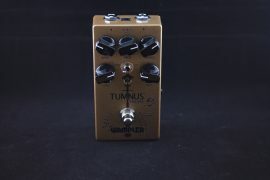 Ironically enough (or maybe totally intentional) the heterodyning emerged when we stuck a Wampler Tumnus Deluxe in the same signal path as the Archer. So if you have a ton of Strymon pedals or you plan on stacking the Archer with a Tumnus, consider yourself warned. There are mods and such that can be done to eliminate this byproduct if you are inclined. 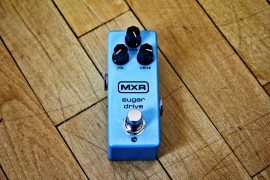 The Archer had NO heterodyning issues with any pedals we tried from MXR, Boss, Revv, Fortin, Earthquaker, Donner, or Daredevil. Depending on how you use your amp’s effects loop, the heterodyning may also be a non-issue for you. Another thing that we feel the need to let you know is that the Archer is extremely robust. It is heavy and the casing seems very durable. We did not do a drop test, but it feels significantly more physically resilient than most other pedals. 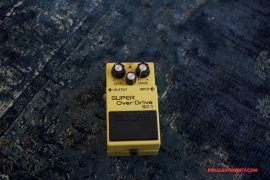 Obviously this does not have any effect on the sound, but if you are somebody who tends to crush their pedals, this is a feature that you will want to be aware of. Not much signal loss or frequency gouging here but you can see that the buffer’s work is definitely on display. Compare this to the bypassed signal and see why klone units are often called “transparent” or “natural” sounding overdrives. The guitar’s natural frequency ratios remain intact, while the amplitude is increased across the board. Now compare this graph to the corresponding ones that we made for the Boss SD-1 and the Deadbeat Visible Overdrive, and you will see just how different of an animal the Archer, and the klone circuit in general, really is. The evenly boosted signal that the Archer provides allows you to retain all of your guitar’s character while still clipping the signal so as to provide that classic overdrive grit. There is a slight mid-hump that you can see particularly in the lower mids, which is kind of just how the Archer is voiced. It is more midsy than some other klones, and given that it does not have a mids control, this is something you are going to have to like in order to be happy with the pedal. Overall we thought that the extra dash of mids helped place the guitar nicely in the mix and add some unique character to the overall tone. 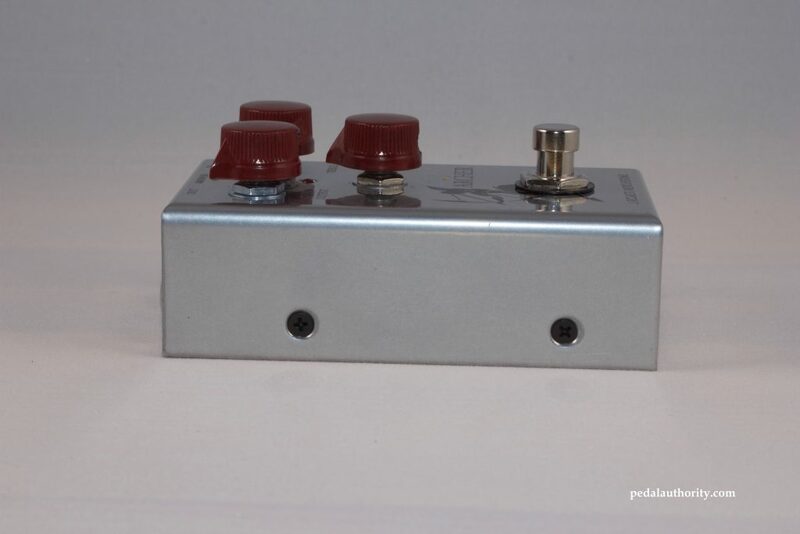 Here we have another popular low gain klone setting. There are legions of players who prefer to use their klone as just a clean boost, and therefore leave the gain setting at 0. Here is the most extreme example of that application that the Archer provides. 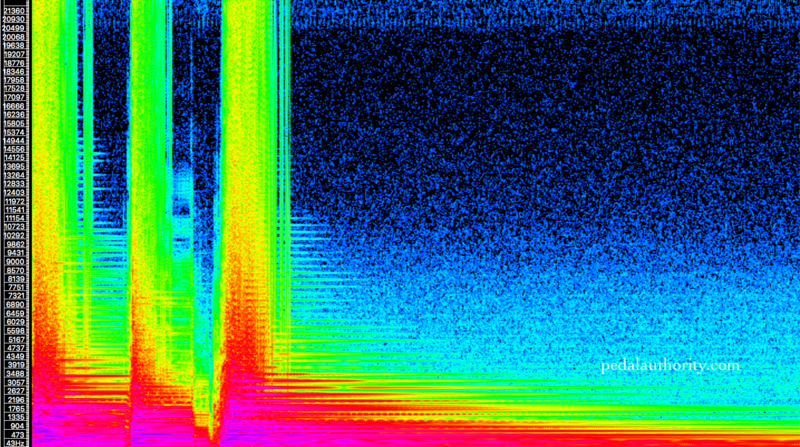 Notice that the integrity of the input signal’s frequency framework is still preserved, and that there is a healthy but not overbearing or unnatural amplitude boost in the higher frequencies. 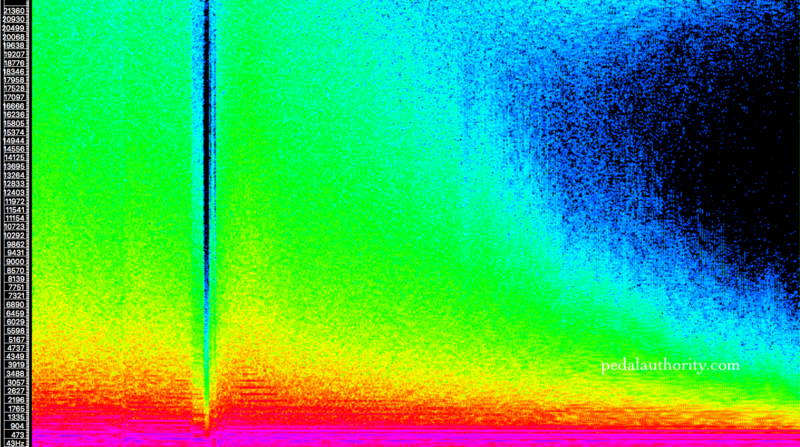 Again, the overall “naturalness” of the input signal remains, while some fine tuning is applied selectively. This treble-heavy setting can be used to get a little more cluck out of your instrument (if you need some extra spank for your chicken pickin’), or to tighten up the low end of your amp. Here we have set the controls for that classic violin-like lead tone that Eric Johnson likes so much. 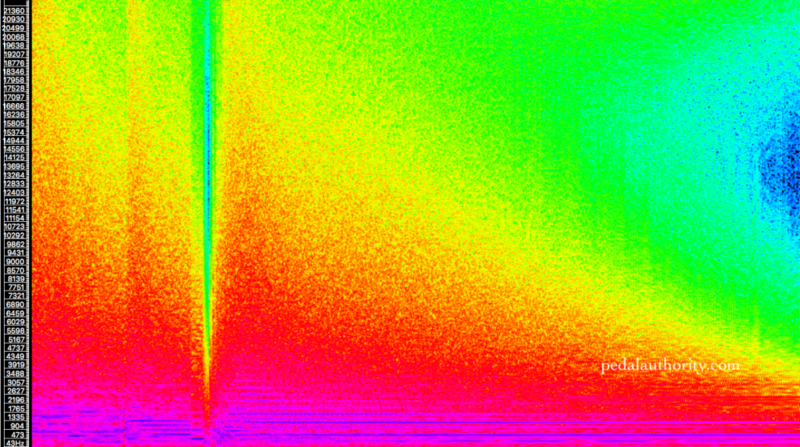 Interestingly enough, this graph looks almost identical to that of the Boss SD-1 at its most neutral setting. Talk about a fundamental difference in voicings! The most obvious difference here is that the Archer still has that mid boost, and so the throatyness of the Klon sound remains a part of the equation. 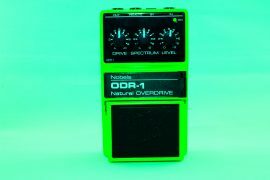 Isn’t it fascinating that an extreme setting on one pedal can produce results equal to those of another pedal’s neutral setting? This is the most maxed out setting on the Archer, and you can see that this setting contributes a significant amount of amplitude to the signal. Notice though that the frequency gradient remains largely true to the unprocessed signal, meaning that even at its fullest setting the Archer will never make your guitar sound like anything other than a guitar. 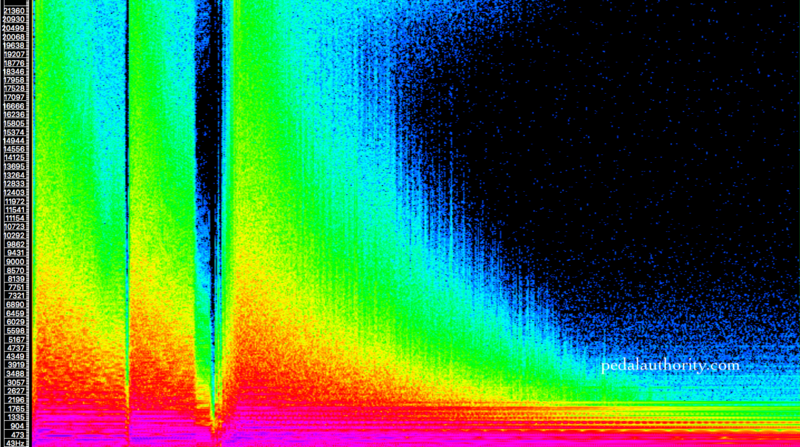 Basically everything gets louder and more saturated (Would you look at those mids!?) 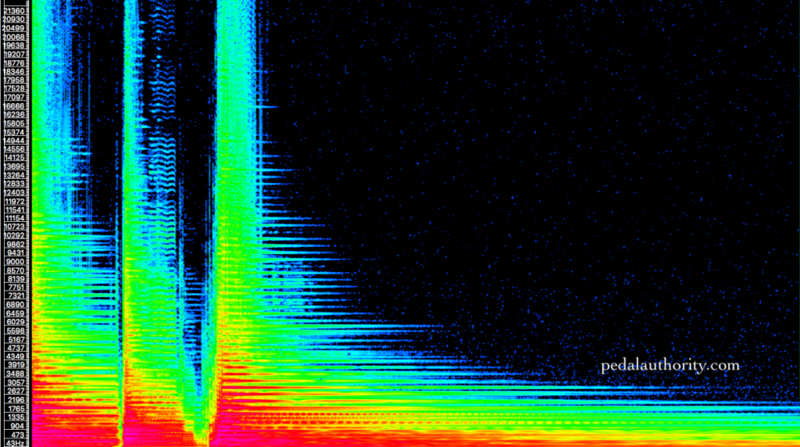 but the fundamental character of the instrument (from a frequency perspective) is still there. There really is something special about this circuit, and from this perspective it actually does provide you with a very “natural” sounding overdrive. You don’t have to be a klone chaser or blues fanatic to get into the Archer. 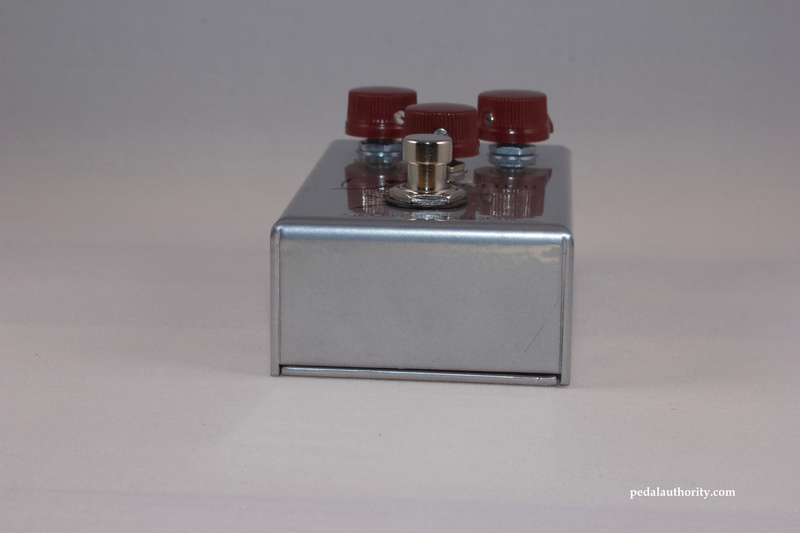 In fact, you don’t even have to be familiar with the Klon sound at all. The Archer stands on its own as both a faithful and versatile take on the old classic, and it pairs well with both high gain and low gain rigs. 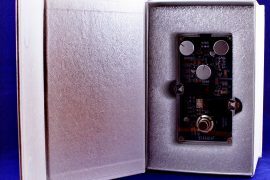 At a fraction of the cost of an original Klon, the Archer is a great value and worth checking out if you are even the slightest bit curious.